Hmm, hmm, it’s dusty in here. That’s what happens when you are away for a long time, the dust sits everywhere. At the beginning of the year, I was full of energy to make things but gradually life took over. New responsibilities at work and house hunting kept me away both from making and blogging. I went into full hibernation in these two sectors. I didn’t even have the energy to comment on your posts, despite reading them. Now that the days got longer and I finally see the light when I leave home, I feel awake and like the flowers in spring ready to bloom. The weather isn’t very supportive lately though. We have some lovely days and then the cold, admittedly less, returns. Back in the winter and the long darkness of the months, my mum bought me some lovely fabric, while visiting the UK. In a magazine, I saw this dress and overestimating my limited skills, I wanted to do some sort of version of it. I was more drawn to it because of the colour rather than anything else. I thought Tilly’s Francoise dress was the perfect pattern, as the A-line skirt would make it easy to fit one dress inside the other, right? Well, it couldn’t have gone more wrong than it did. 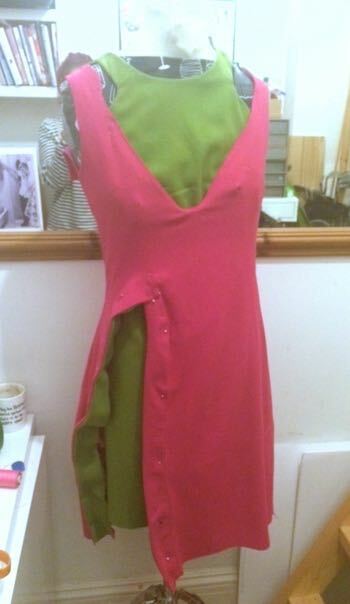 The polycrepe, I was using was too soft for that kind of job resulting first in the neckline of the pink dress widening dangerously on the one hand and on the other, I cut the slit at the front without even thinking what would happen when this of fabric is cut diagonally; DISASTER. I tried to fix it by adding some interfacing and fabric. Please don’t cringe, I was improvising, without having any idea what would work, if anything. At that point I even started disliking the colour combination and cursing the amount of time I had put in this project. 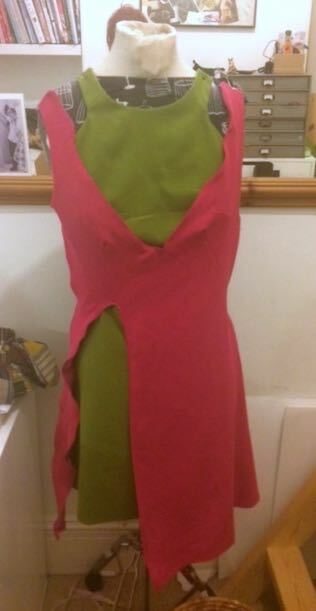 Finally, I made another Francoise dress for Tilly’s competition, which was the reason I was sewing the below, in the first place. And then I left it hanging on the mannequin for weeks and weeks, until the light came back to the days and felt that it was time for more bright colours. I took it all apart, every single piece of it. 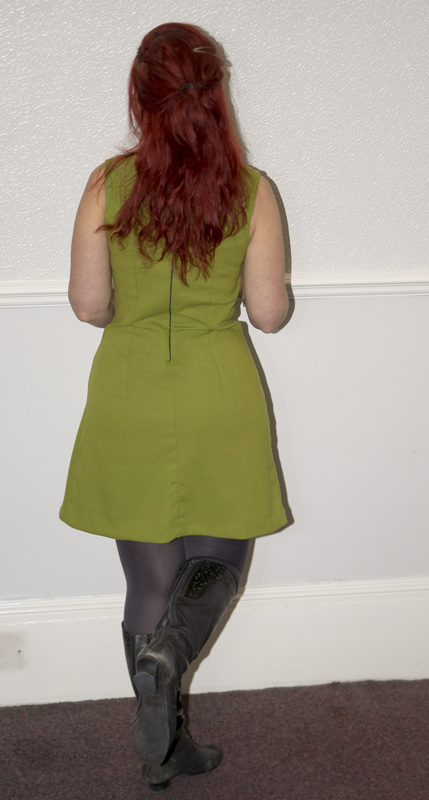 Luckily, I had some extra green fabric, which I used to cut the back of the dress that was pink in the unsuccessful version. This wasn’t easy to make either. While making the first version, I made changes on the neckline taking it in substantially. My top is much thinner than my bottom, praise for the pear shape in a pear colour, haha. However, the pattern with the changes was nowhere to be found. I’ll tell you a secret, I have this drawer that eats patterns. Lately, it threw up the hudson pant pattern, I guess it couldn’t digest it, so now I can finally make it. Back to the Francoise, I had to make the same alterations from scratch and it took a while. The neckline is still a bit wide, but I don’t think I could have done anything more, or maybe I will try and fix it again at a later stage, when I have more energy. I like solid colours because they work well with patterned pieces, what I don’t like is plain, there must always be that little something and in this case, it was some glass beads that I have carried around moving houses and towns for many years and I decided they were the perfect match for this dress and so I threw them on. I’m not very happy with the back view but any changes will have to wait in line. I think it is very wearable in general and it will serve its purpose. Hopefully, I will be back here before summer haha!! How are you doing with your plans from the beginning of the year? Any others who were in hibernation out there? 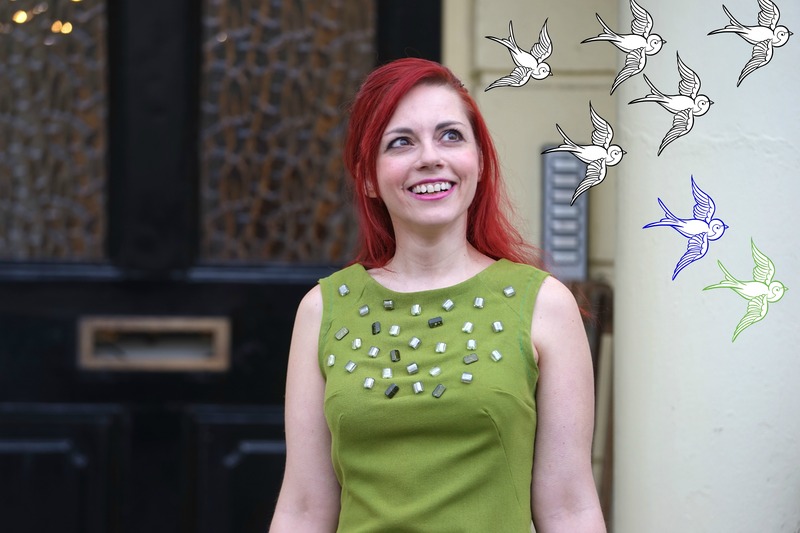 This entry was posted in sewing and tagged francoise dress, handmade, sewing, Tilly and the buttons. Bookmark the permalink. Thank you for visiting! The beads really make a difference, hopefully the weather will help with wearing it! That green looks lovely on you. Nice job on the dress too. You have made it very unique with the beads. I’ll be watching for your pink Bellatrix! Thank you! I would have been very sad if I hadn’t manage to turn this colour into something wearable!! So cute, I love the bling! Was that hard to do? No the bling was easy, it takes a bit of time but not hard at all, well worth it! Great colour and I love the beaded neckline! LOVE this color on you! You look so cute in this silhouette, too. Can’t wait to see how your blazer turns out–another great color, for sure! Thank you! Blazer is almost done, so hopefully it will be up soon! I have the same issues with top vs bottom. Anyways dress looks wonderful, I love the glass beads! Thanks you! The top -bottom difference is a real bummer, makes the bottom size feel huge compared to the top, haha!! Thank you for visiting! I’m getting a bit tired of dying my hair lately but it goes so well with colours haha!! All the best from Brighton! Love the beads, makes a truly unique dress. Thank you! I’m glad I have finally used these beads, I kept losing them with all the house moves they’ve been through!